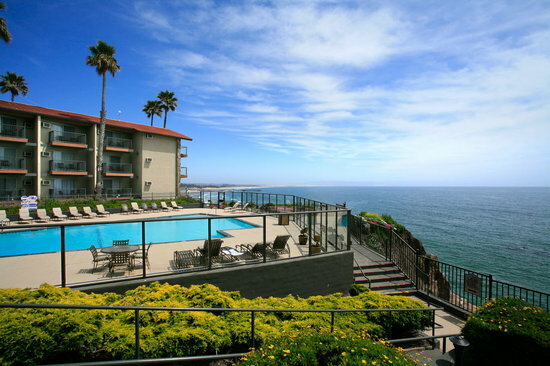 The Best Western Plus Shore Cliff Lodge, in Pismo Beach, CA, has beautiful views of the Pacific Ocean. This oceanfront hotel features 100 guest rooms, including six deluxe family suites, remarkable service, unmatched ocean views and well-appointed amenities. They even have a limited number of dog friendly rooms. Every guest room at the Best Western Plus Shore Cliff Lodge offers scenic ocean views from a private balcony or patio and features pillow top mattresses, a compact refrigerator, microwave, coffee maker with Seattle’s Best Coffee and Bath and Body Works toiletries. Relaxing sounds and sights of the ocean can be observed from many different look out points on the Pismo Beach hotel’s grounds. You may even catch a glimpse of a swimming dolphin or whale from the hotel. The Best Western Plus Shore Cliff Lodge is located just blocks from the Pismo Pier and downtown Pismo Beach in the heart of San Luis Obispo County. Be sure to enjoy the local attractions including championship golf courses, hiking and biking trails, kayaking, Pismo Beach and other area beaches, wine tasting, Hearst Castle, Oceano Dunes and much more in Pismo Beach, California. "This hotel is one of my top 10 places to go for a relaxing get a way. Love the views! California coast is always beautiful but the Central Coast is an almost sure guarantee for good weather. I will definately be back!" 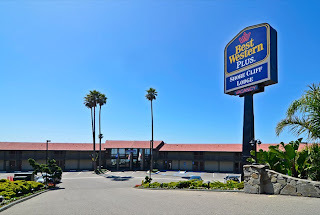 Whether you long for a romantic getaway, a successful business trip or just need a convenient stop between San Francisco and Los Angeles, the Best Western Plus Shore Cliff Lodge will make your next Pismo Beach vacation unforgettable.